Honoring our pets and our relationship with them. What great love I have for you. You touched a very special part of me. I think of you and there is love. I honor you. I love you. And I thank you for blessing my life. and appreciate you and all that you gave. it is more than the emotional. The love I have for you is always there. Our relationship and love is timeless. You will continue on with me, and I with you. 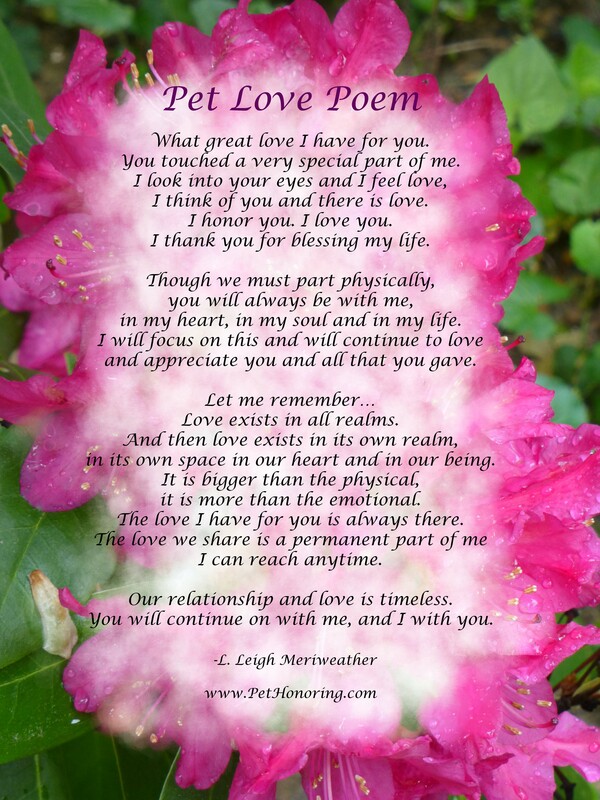 This entry was posted in Pet Poems and tagged Pet Poem; Pet Memorial Poem: Pet Love; Pet Love Poem;. Bookmark the permalink. What a beautiful poem and wonderful sentiment. I couldn’t agree more. It is so comforting to realize how timeless and limitless the love that we share with our pet is. The gratitude expressed in this poem truly captures how I feel toward my pet every single day. It’s nice to connect with someone who feels the same love and appreciation for pets that I do for mine. Thank you for your heartfelt words.